The Newsroom Season 2 premiere: A recap. 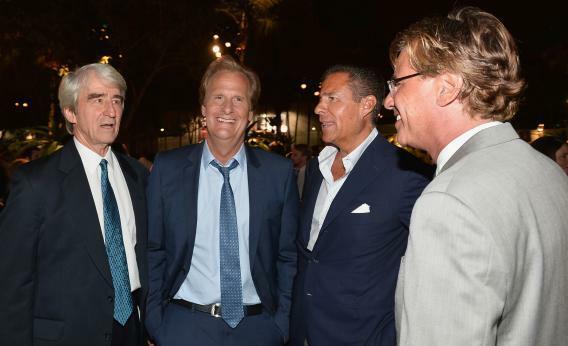 Sam Waterston, Jeff Daniels, HBO Co-President Richard Pepler and series creator Aaron Sorkin attend the afterparty for the premiere of The Newsroom Season 2 on July 10, 2013, in Hollywood. At least the show makes somebody happy. Alas, having seen a few episodes of the new Newsroom season, I’m sticking with Team Hater. As this nine-episode arc unfolds, I’m going to pick apart episodes with the help of a few fellow reporters, and let readers in on a none-too-secret secret: Reporters are grimly fascinated by this show and its pawing attempts to make statements about America and the press. I watched the premiere again last night in tandem with Jim Newell, a writer for (among other places) Gawker, Salon, the Baffler, and Wonkette. Jim: Did you enjoy Aaron Sorkin’s The Newsroom, Dave? Dave: Well, the critical consensus is that this season of The Newsroom improves on the flaws of season one. Right? That’s what I’d read. Dave: That’s a good way to put it. Will McAvoy is suddenly spooked at the backlash engendered by his heroic habit of Keeping It Real, so instead of going on sort of amusing political tears, he’s just sort of riffing. With helpful commentary from the rest of the cast, about how funny that is. “Well, will one of you f–k her?” asks Will during the meeting with the lawyer. “That was kind of funny,” she says. Jim: Yeah, Sorkin still has that great touch with the ladies. Let’s have McAvoy and Charlie talking over/flirt with this “sorority girl” before schlepping her out of the man’s office and not really answering her questions. And here is Maggie, screaming on YouTube, because she’s a crazy girl. Better break up with her, yikes! But let’s give it up for McAvoy’s latest martyr move, calling the Tea Party the “American Taliban.” That was definitely a hill worth dying on—what don’t these suits get about that? Dave: There’s no Julian Bond in this version of Earth, I guess, because that was his line. But I understand its role in the story. Same as I get the YouTube subplot. They’re both pretty flimsy, but they dynamite a couple of stories that had gotten stale last season. These would be: Will always winning, and the love triangle existing in any form. That was a dreadfully dull love triangle, although the flash-forward informs us that Sorkin will take the characters forward by having Maggie make an impulsive decision that ends in personal tragedy. So I guess we haven’t changed the “female characters being brash and hysterical” theme from last year. But about that! We both lived through the soul-rending horror of the Romney-Obama campaign. What did you think of Jim going on a Vision Quest to Nashua? Jim: Well when things aren’t going well with the lady, you’ve got to get out of town. I get that. Even if it means going to ride on the stupid Romney bus, or not, as it turns out. Coincidentally, the Romney press aide was probably my favorite character here, not letting Jim on the bus over the “American Taliban” remark. I doubt that Romney and his campaign would’ve been so viscerally offended by a nasty remark directed at the Tea Party that they wouldn’t let that person on the bus in spite, but whatever, it is a TV show. Dave: We know what happens to the Romney campaign, don’t we? Watching that staffer be a jerk was like watching a Nazi in an Indiana Jones movie boast about the power of the Fatherland. THIS IS NOT A COMPARISON BETWEEN THE ROMNEY CAMPAIGN AND THE TENETS OF NATIONAL SOCIALISM—it is the only analogy at hand. And, no, it doesn’t feel like the sort of thing a campaign actually does in the age of Twitter. Romney didn’t need to sweat to win New Hampshire. The costs of having every reporter write a story about his wimpy censorship would have outweighed the righteousness of him blocking this producer. I remember the flak Michele Bachmann took because her bodyguards manhandled a couple of reporters. Jim: Anyway, Will realizes as the episode goes on that self-righteously spouting “American Taliban” was probably not worth the price. Will this season show McAvoy/(Sorkin) being put in his place? Dave: I think starting the season with his humbling means he’s going to climb back to his rightful hubris soon enough. Speaking of hubris. So. Occupy Wall Street. Dave: That was certainly a thing that happened. Jim: Dave, I must tell you something. There is a website that was registered. It’s called “occupywallstreet.com.” There are these people, lurking, waiting to launch a revolution. There will be tents. Thousands of people. It could be the greatest story of all time, this so-called “occupation” from Canadian magazines! Dave: In Neil’s defense, the rest of the stories in that pitch meeting were horrible. A .gov site for public input on deficit reduction? Jim: My recollection is that no one gave a s–t about Occupy Wall Street until a white girl got pepper-sprayed, and then everyone covered it. Dave: In some way I admire Sorkin for recapturing the “oy, thank God, something new and weird to cover” spirit of Occupy. But you’re right, he speeds up that process. Jim: Yeah, and he gets the media confusion at first (and forever) correct. The awkward “so do you guys have any … goals?” interviews and so on. No mention of drum circles yet. Dave: No, there was one mention of drum circles, when the attractive woman who’s sort of planning everything tells Neil that when the media arrives, it will focus on the hippie nonsense. Which was true—I remember Erin Burnett heading down there with CNN cameras and leading with the goofballs, so as not to distract from the serious news about stock prices. The Occupy stuff was some of the most troublingly weak material in the season trailer, but for this one episode, the very least, it’s fairly well-handled. It’s immediately clear that the activists are too smug and jargon-addicted to achieve anything. It’s clear that the media won’t really cover it unless there’s violence. Jim: And so far the proto-romance tied into it only involves two people as opposed to the usual four, so that’s good: restraint. The drone talk was sort of sloppy but did nail down the typical dynamic for drone debates: one going “DRONES DRONES!” and the other saying “THEY KILL TERRORISTS, PERIOD. PERIOD,” and no actual debate ever happening. Dave: Do you think that brilliant handling of the debate was accidental? It was reduced to core elements in an enjoyable way. Just as she did when she figured out the debt ceiling crisis six months before our Earth-1 media did, Sloan just walks into Will’s office and says two words until he covers the story. “Drone strike. Drone strike.” (Shakes piece of paper.) “Drone strike.” And she’s eventually shut down by an obviously crazy military veteran-turned-pundit who quotes Popeye. Dave: Yes, the other other other subplot, about Will causing the suits to get shut out of a SOPA meeting on the Hill. The best part of that scene was our oily corporate friend apologizing for his lateness by saying “I was at the Jefferson, I couldn’t get a cab.” The best part of the following scene was Sorkin’s cheek in making Jane Fonda utter the phrase “f–king pajama people” to refer to the Chinese. Her greatest indignity since co-starring with Lindsey Lohan in Georgia Rule. Dave: You can’t go wrong with a good mainframe scene. Whether accidental or not, this episode captured the tedium and strange news judgment of summer 2011 pretty well. I guess “Genoa” is the new “Qumar” (the fictional Middle Eastern country that was always causing trouble in The West Wing,” so President Bartlet could be a leader), so we know where our next lesson in journalism is coming from. That’s all, I suppose. Thanks for watching this with me. Jim: Yup! This will probably be the last episode I watch.